Careful what you wish for goes the saying and in Aaron Smith’s situation this was the very truth. His fake pictures of himself winning the lottery went viral on Christmas day only to realize few hours later he indeed won the £1Million EuroMillions Jackpot. Waves of shock and happiness filled his Christmas day as he got together with his family members to celebrate. Below is his story which has proven to be one of the funniest ways to find out you've just become a millionaire. “It was a massive shock. I couldn't believe it. 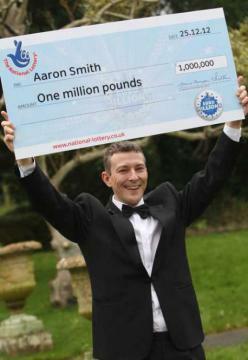 I had to verify it at least 10 times.” - This was the first reaction Aaron Smith had when he realised he had just became millionaire. He was in his family home, enjoying a normal Christmas day. He went on to say that he always knew he would one day become a millionaire and even though Aaron played lottery for many years, that particular ticket was bought while on a last minute Christmas shopping trip. This just shows that when it’s your time to be millionaire, the ticket will find your hands. One of the big ironies about this winning is the fact that only few hours before realising he had won, Aaron indulged in some pranking on social networks. He and his brother decided to pose with champagne and a EuroMillions ticket implying that they'd won £1Million and post it online. Never had they considered that this picture will soon become a reality. Aaron, 40, works at a Bournemouth financial services company and became the latest of 25 new millionaires created by the UK’s bonus EuroMillions draw from this Christmas day. Smith's plan was to share his jackpot with his close relatives.